Have you heard about a new data plan called MTN Pulse Instabinge bundles? Instabinge bundles is one of the heavy data plans offer that's associated with MTN pulse Tarrif plan package. 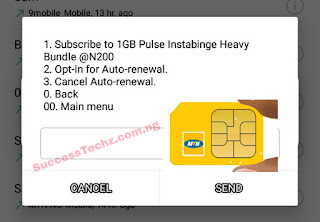 Which means to enjoy MTN Instabinge data you must already on MTN pulse Tarrif plan. The new MTN Instabinge data Package comes In two types, Heavy lite bundles and Heavy bundles, The lite bundles gives you 250mb for just N100 While the other Heavy bundles gives you an awesome 1GB data for just N200. Which can be activated on all MTN sim either new or old or 4G sim. 1. First of all, to enjoy the MTN pulse Instabinge bundle package, you have to migrate to MTN Pulse tariff plan dial *406*1#. It's free, and also you might be charged a fee of N100. 2. After your migration successful, To subscribe to Pulse Instabinge data plans, kindly dial *406#, then reply with 4. Then Press 2 to choose Heavy Instabinge bundles. Then press 1 to purchase the data cost N200 only. 3. Once you have been given the Instabinge 1GB data, N200 will be deducted instantly, and you can also purchase another data plan to make use of the 1GB data till next date. What's the validation for the 1gig?